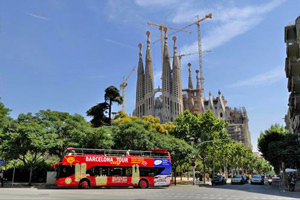 See the main attractions in Barcelona from on board a double-decker bus! With a sight-seeing bus, you can explore the city whilst comfortably seated on board a double-decker bus as you listen to the informative commentary on the audio-guide. You won't have any of the stresses of trying to deal with an unfamiliar public transport system, nor will you have to worry about trying to find the right money with which to buy your tickets, the anxiety about not finding somewhere to sit and having to grapple with numerous changes. Just sit back, relax and enjoy your well earned holiday on an open air sight-seeing bus. There are two different routes with numerous stops which have been created in order to guarantee the best service possible on a journey of discovery of Barcelona's most beautiful attractions. Thanks to the help of a map which is provided for all passengers, you can hop on and hop off whenever you like or, you can just stay on board from the beginning to the end of the tour. All the attractions will be easily accessible from on board the sightseeing bus and you won't have to think about changing your mode of transport! Let yourself be driven by an experienced driver and enjoy spectacular views of the city in comfort. Getting on the bus is the best way in which to see the city in a short space of time and will help you to find your bearings so you can decide what to visit whilst you enjoy the splendid panorama laid out in front of you! The service is available every day from 09:30 to 20:00 hours (depending on the line) and you can choose to buy a pass for one or two consecutive days. Included in the price of a ticket is an Audio-Guide with Wi-Fi access on board so that you can post photos of your holiday on-line straight away. Hop on and hop off whenever you like or, remain on board for a complete panoramic tour of the city. The Green Line: (only during the summer) is the route which will enable you to admire Barcelona's large and very beautiful beaches. Visit the famous beaches of Bogatell, Mar Bella, Nova Mar Bella and much more. On the day of your visit: simply show the tickets on your smartphone to the driver each time you hop on board.